OMG! 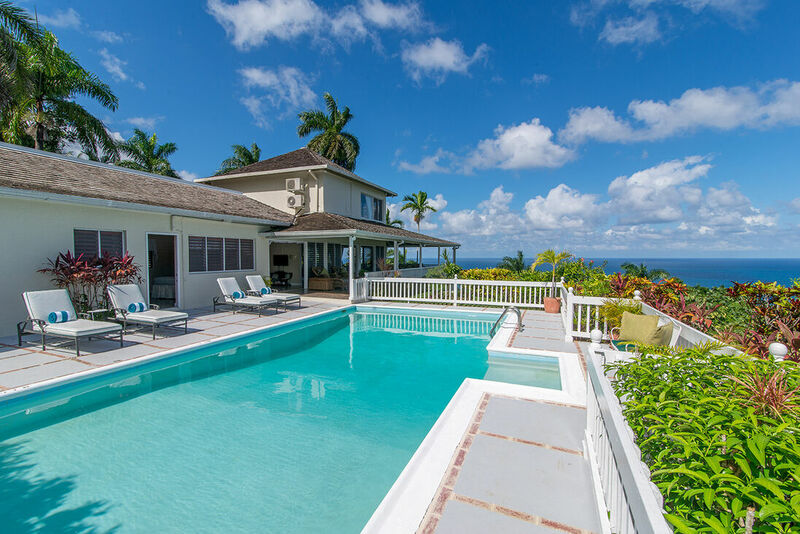 You have found a villa with a VERY SPECIAL OFFER!! COMPLIMENTARY 12 SEATER VAN AND DRIVER FOR WEEKLY BOOKINGS!! 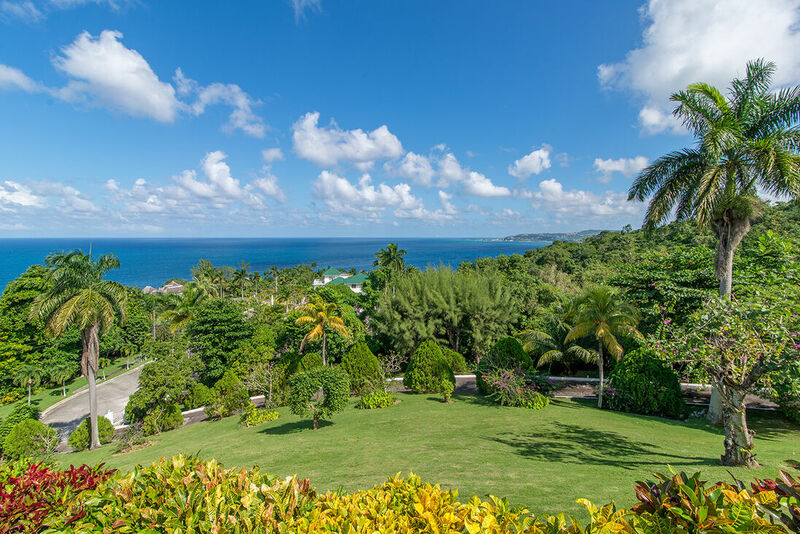 Includes complimentary airport transfers, trips to Negril and over to Ocho Rios! 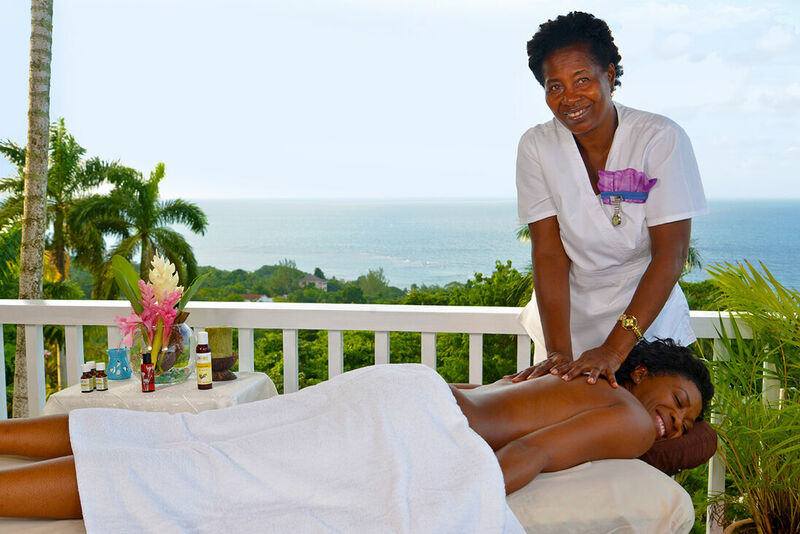 Best way to see Jamaica! 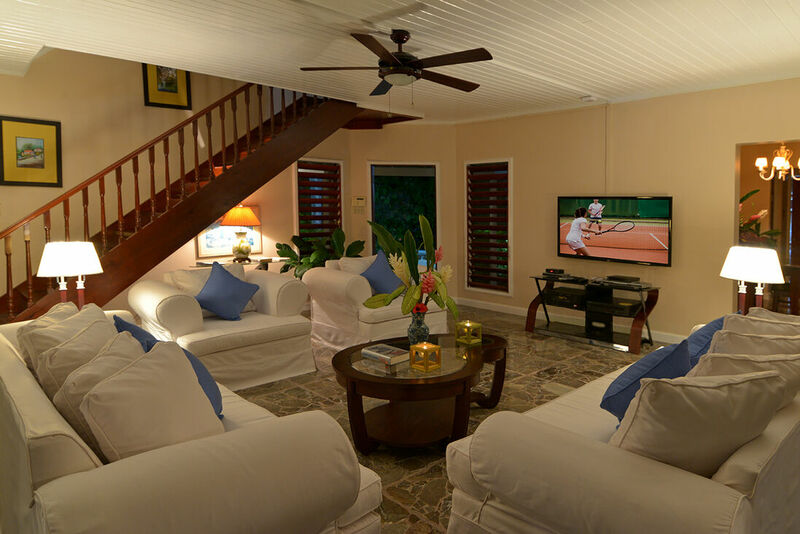 (Guests responsible for gas and tips to driver) Book 7 nights at the 3 bedroom rate. (Applicable to rentals up to April 30, 2019) - Time sensitive offer! 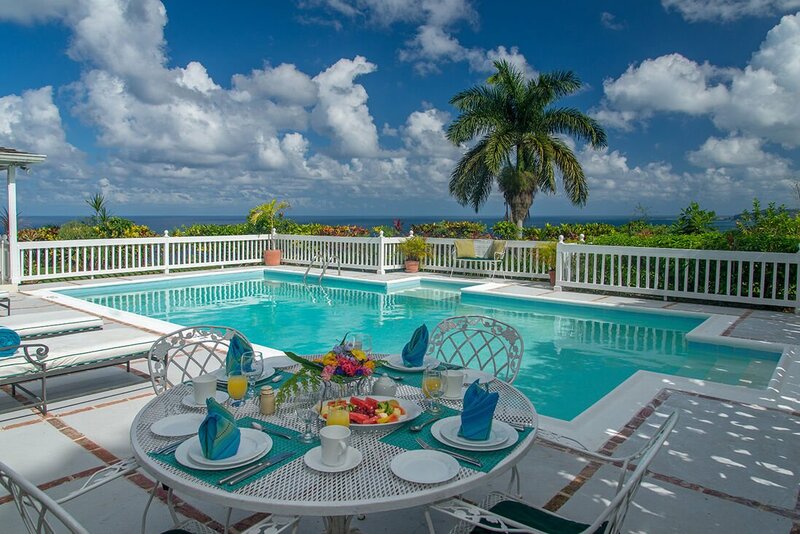 Blue Heaven in Montego Bay one of the most picturesque villas in Jamaica. 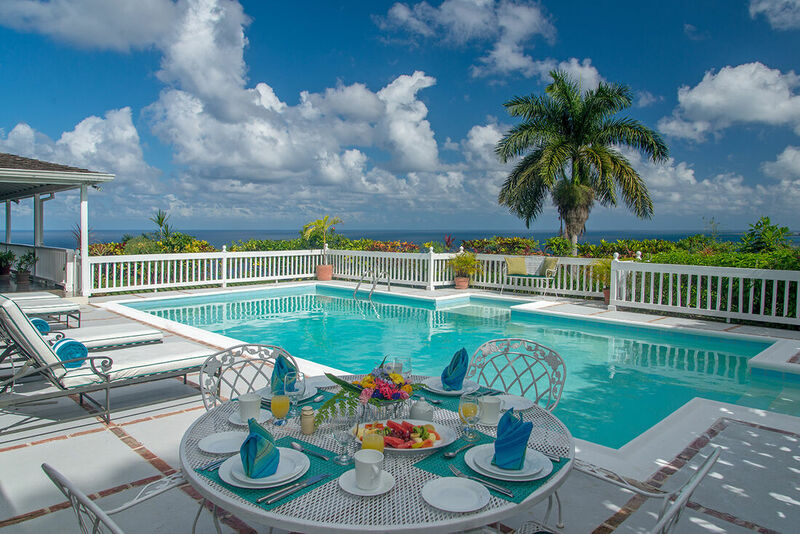 Surrounded by a beautifully landscaped garden, the bougainvillea, hibiscus, periwinkle, frangipani, ginger lilies, bamboo, lavender, ferns and elegant palm trees, the villa enjoys a luxuriant environment. The velvet soft zoysia grass is very welcoming for barefoot walks in the lawn. 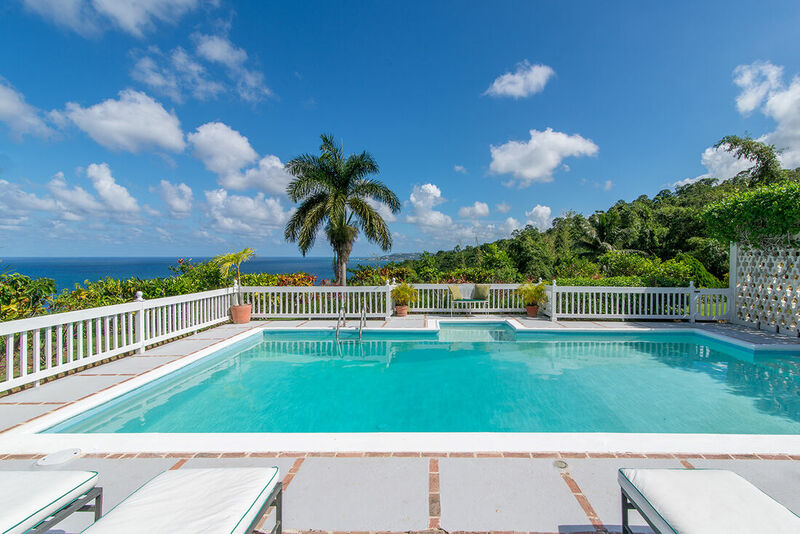 Blue Heaven is the loveliest three-bedroom villa, one of the finest luxury villas Jamaica. 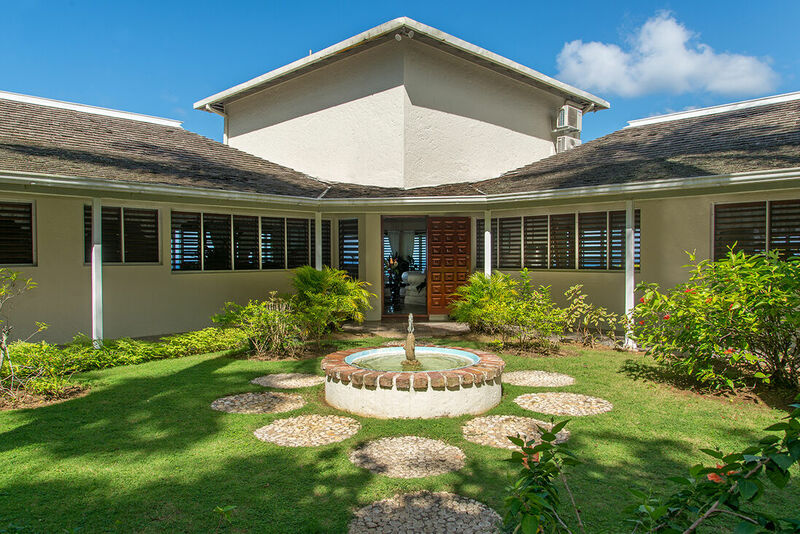 The villa has several cedar louvers and wide glass doors that lead into the wrap-around verandah. 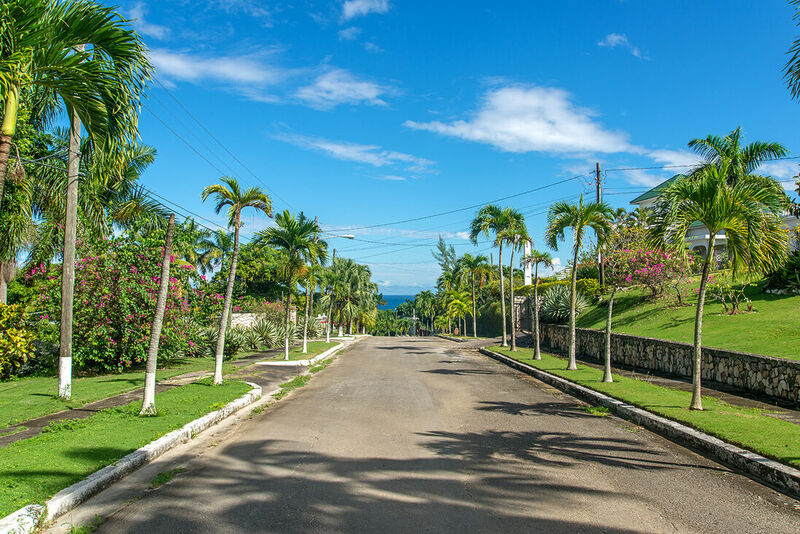 During the day and also at night, the view from the villa is spectacular; the perfect sunsets and sunrises, majestic cruise ships sailing by, magnificent tropical lightning shows in the far distance and the sparkling night lights in the town beyond Montego Bay. Two of the bedrooms are on the ground floor with pastel blue and yellow walls and a connecting bathroom, which makes them appropriate for parents with little children. 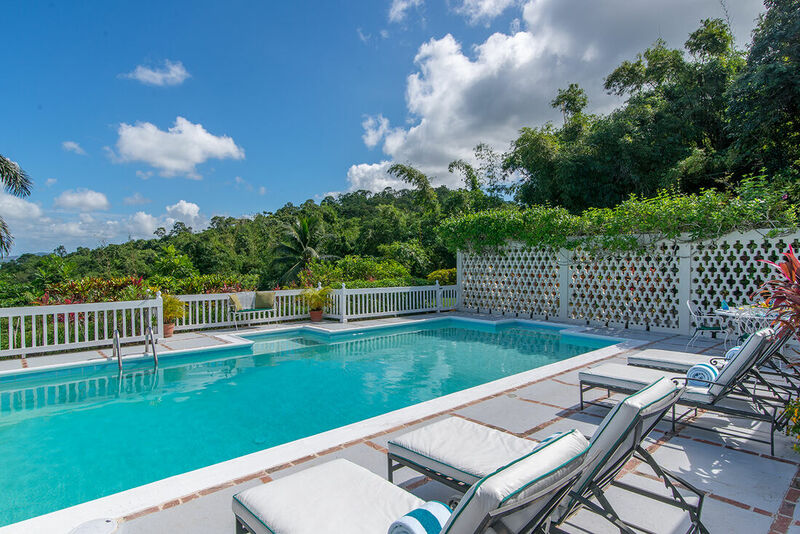 Both of these bedrooms open onto the pool terrace, but have doors that can be locked, so that children do not wander into this area without the parents’ supervision. 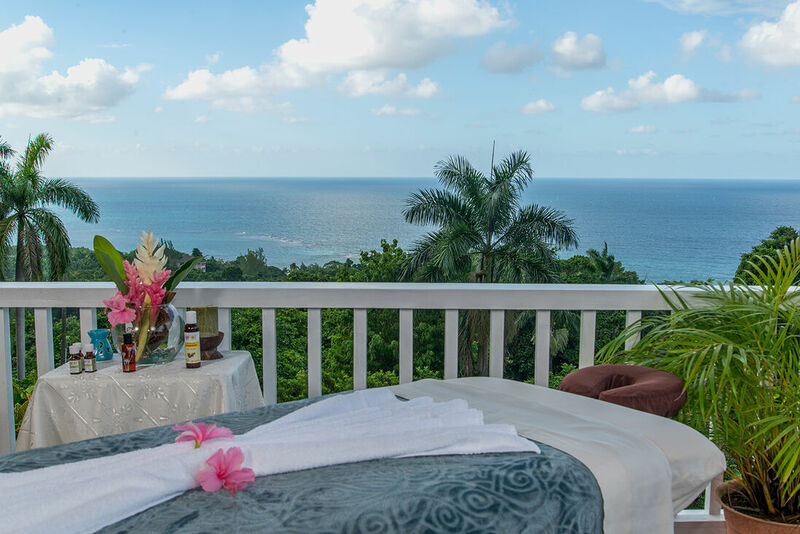 The master bedroom suite is on the first floor and has the finest, most stunning view of the serene Montego Bay harbor with the luxuriant green mountains in the background. 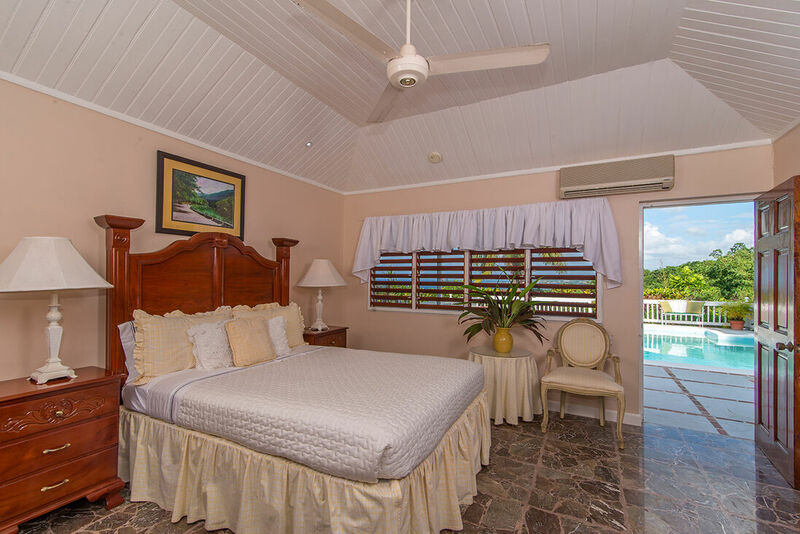 All three bedrooms are air-conditioned. The predominantly yellow and white décor in the living room makes it pretty as a picture, yet vibrant. The amazingly comfortable chairs and sofas create a restful and cozy environment, ideal for lounging around all day. The hand-painted armoire houses the DVD player and television. 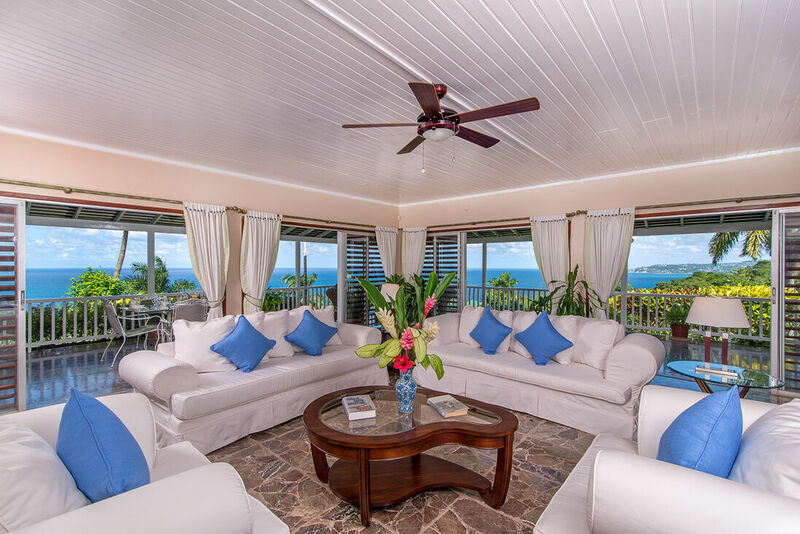 The wide windows in the living room provide a lovely view of the sparkling Caribbean Sea. 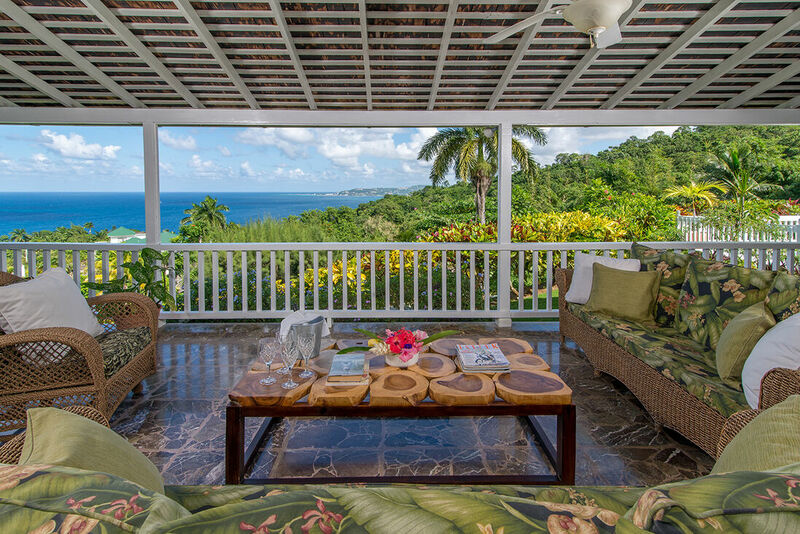 One feature of Blue Heaven that makes it unique among Jamaica villas is the den. 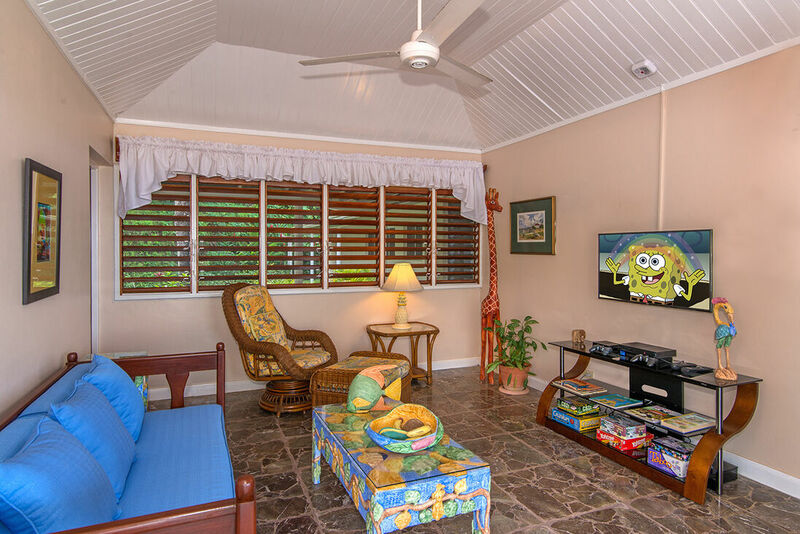 This is the connecting room, a multi-hued den with another television, a DVD player and a games collection, which make it perfect as a children’s playroom. The den also has a daybed that can provide accommodation for one more child. Additional twin-sized air mattresses are available on request. A removable gate is just outside the den so that parents can control the children’s access to the pool. 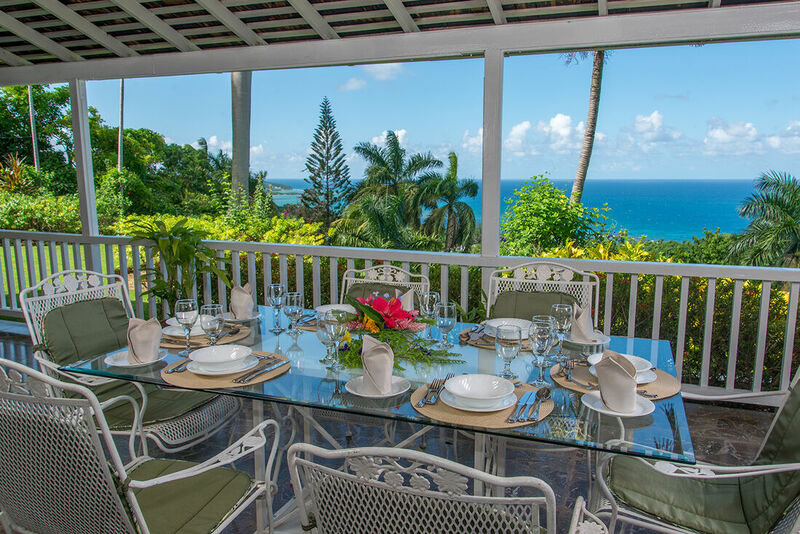 Meals at Blue Heaven can be served on the airy verandah or in the dining room. The cook, Herga is very talented and jovial, always keen to prepare meals individually for children or for the adults. 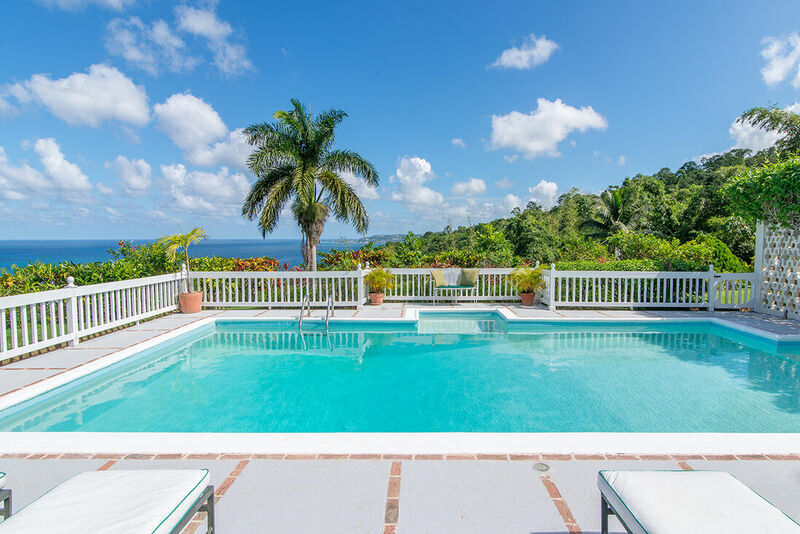 DISCLAIMER: The Resort membership is valid until December 31, and that renewal is dependent upon the Resort agreeing to offering it and the owner accepting to pay for this membership. 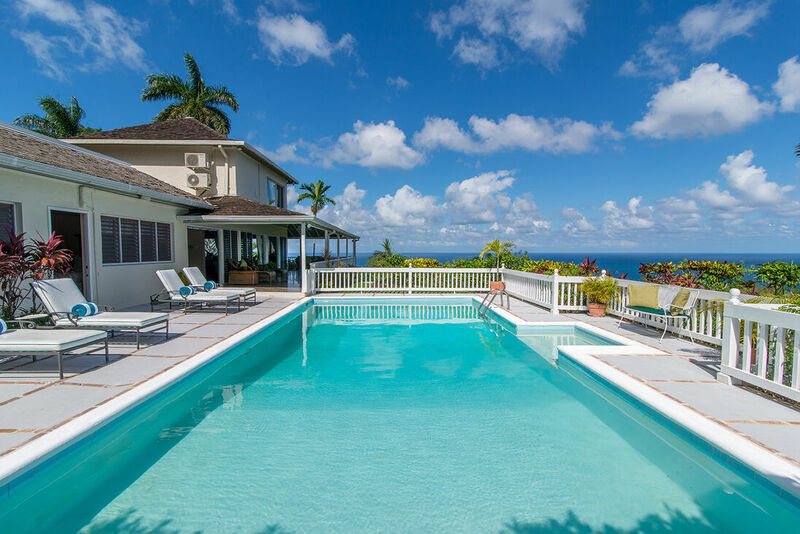 Any changes to this membership or withdrawal thereof is beyond our control and this villa should not be booked solely because of the membership alone. Refunds for this accommodation will not be given for the reliance or any changes to the Resort Membership alone. 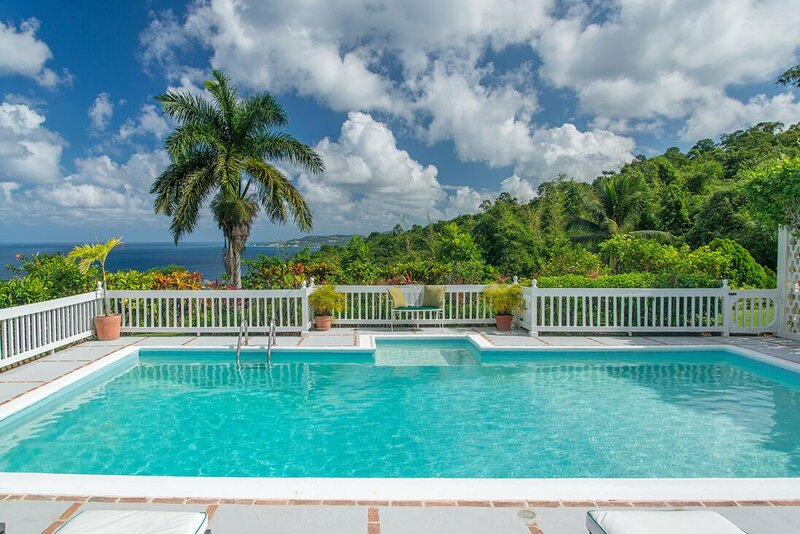 -I understand why the owner named it Blue Heaven – amazing views! -Paulette is the cook and made us a yummy welcome drink with lemongrass and mint. Her specialty is curry goat or curry chicken. 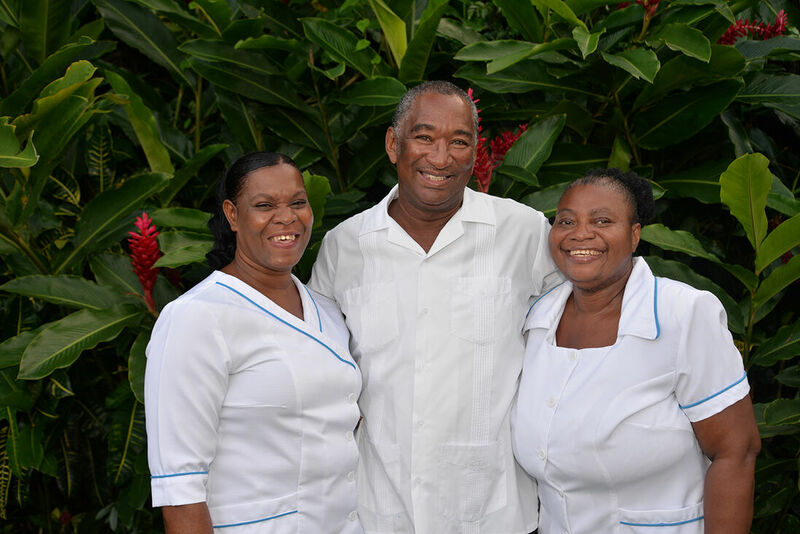 -Marva is housekeeper and Lloyd is gardener. 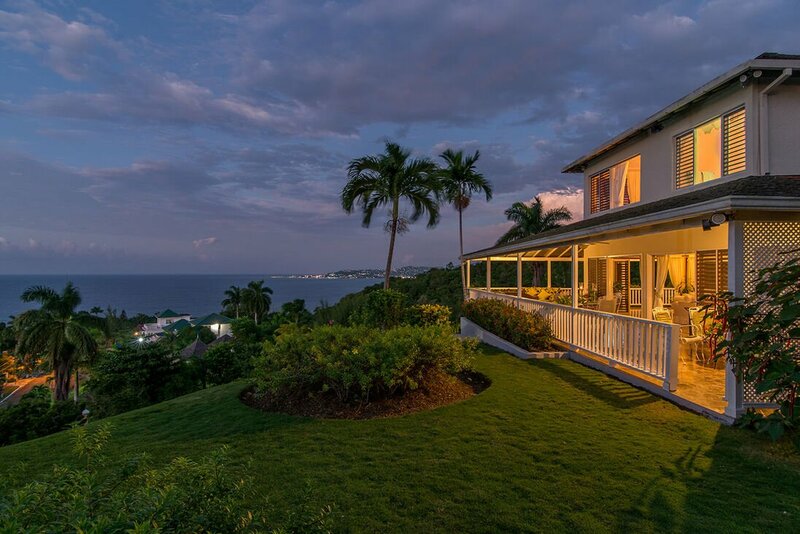 -Private villa with view of Montego Bay twinkling lights at night. 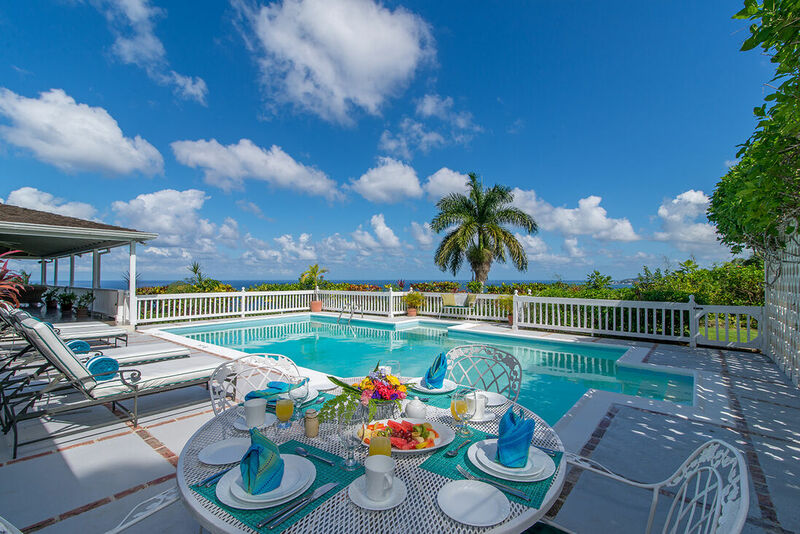 -Both outdoor and indoor dining. -Main TV living room with awesome views. 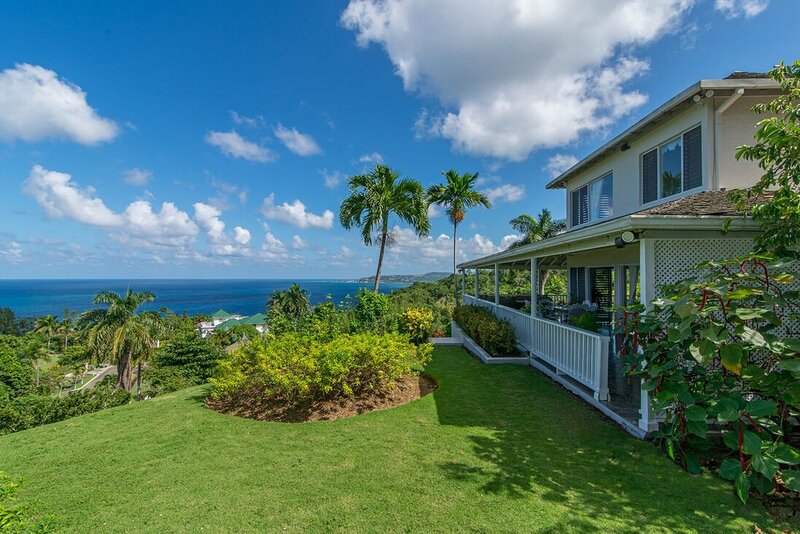 -Wrap around verandah with stunning views. -Little TV sitting room on other side of the main TV living area. -Bedroom 1 on lower level with queen bed. Can walk out to the pool from this bedroom. Ocean View! Bathtub/shower. -Bedroom 2 on lower level with a King and ocean view. Shares bathroom with the first bedroom. 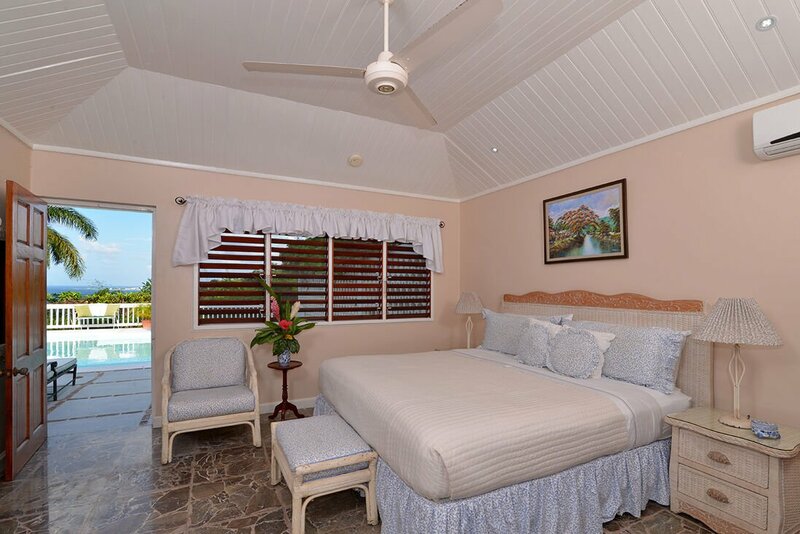 Still has 2 private entrances to this bedroom off the pool deck or front of house. -Walk up interior staircase to the master on the 2nd level. 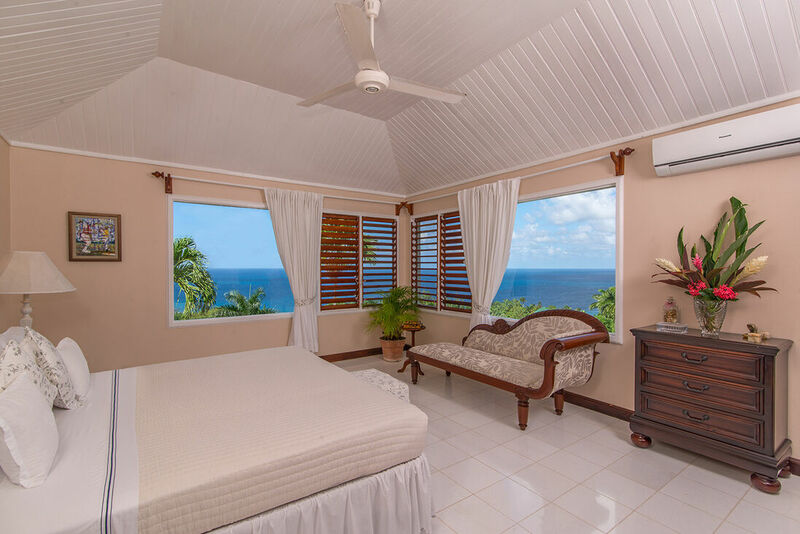 -Master bedroom with a King and incredible views. 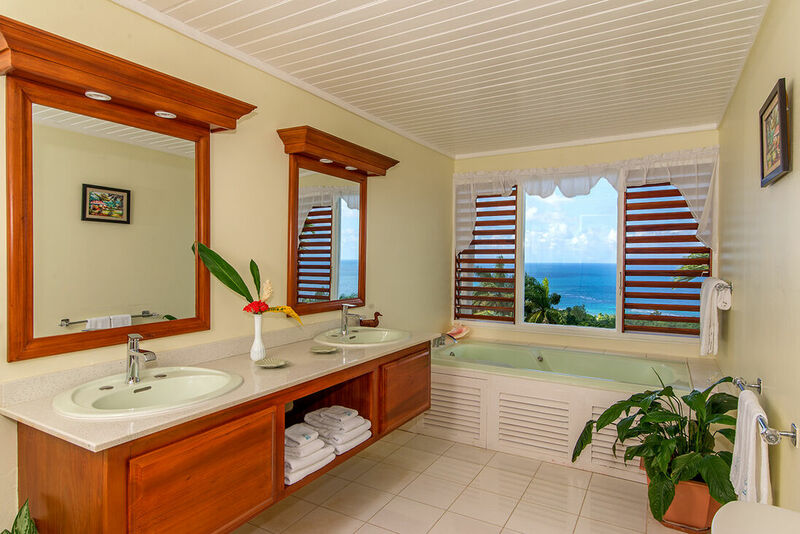 Has a bathtub with views! Shower also. 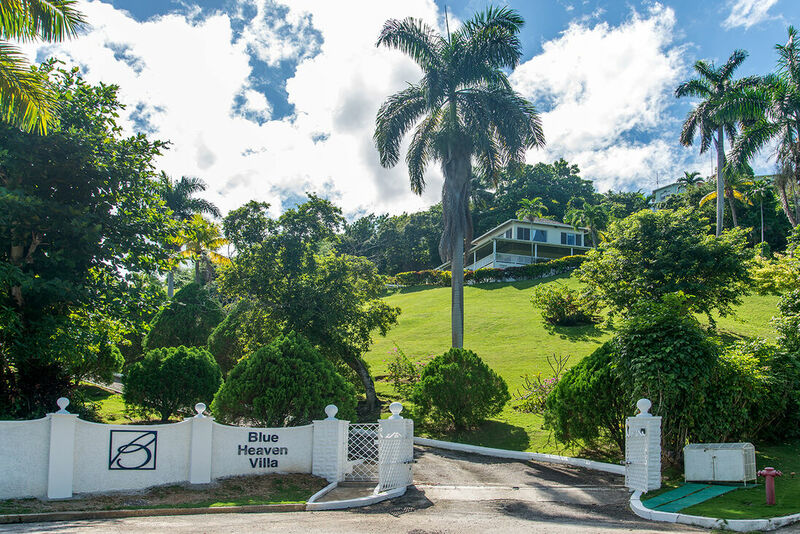 -Tryall Membership – 5 minute drive down the hill.